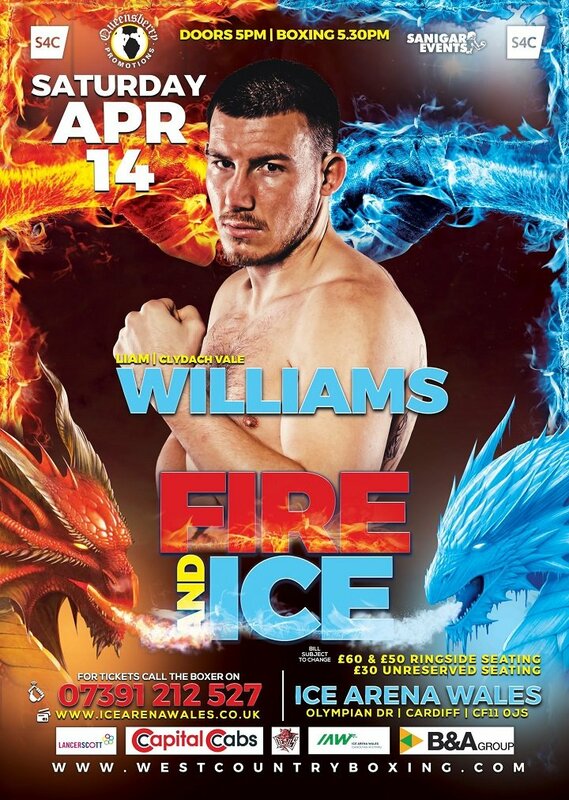 Sanigar Events and Queensbury Promotions are proud to announce that former British and Commonwealth Super Welterweight Champion Liam Williams has been added to the huge night of championship boxing at the Ice Arena Wales, Cardiff on April 14th live on S4C. Liam returns to Wales after seventeen months following massive back to back clashes with domestic rival Liam Smith. The popular fighter from Clydach Vale will box for the second time at the Ice Arena Wales, last time scoring a TKO against unbeaten Gary Corcoran in arguably the best win of his career. Williams will box in an 8 round contest against an opponent to be named shortly. Her opponent Jorneac is a tricky southpaw, originally from Romania but has boxed her entire professional career out of Germany. She has 8 wins on her record against just 2 defeats, both coming against undefeated opposition and is ranked number 2 in Europe. This will be the biggest test of her career so far and the chance to stage an upset and boost herself into the top 10 of the world ratings. Two supporting title fights include recently crowned Welsh lightweight Champion Gavin Gwynne boxing unbeaten Ciaran McVarnock from Belfast for the vacant Celtic Super Lightweight Championship. Both Gwynne and McVarnock hold similar records although Gwynne’s win over Henry Janes will make him the slight favourite going in to the contest. Former Welsh super-welterweight champion Tony Dixon will hope to become a two weight Welsh champion when he battles Pontypool’s Kieran Gething for the title at welterweight. Gething is the former amateur captain for Team Wales and has made a fast start to his professional career boxing 6 times in 13 months and has his sights set on winning the prestigious national title. Former British title challenger Craig Kennedy is on the comeback trail and hard hitting Welsh light heavyweight champion Nathan Thorley will aim to follow up on his impressive knock out of Commonwealth medallist Jermain Asare with a big win against a top international opponent. Olympic silver medallist Fred Evans now 3 wins 0 losses will continue his accent through the pro ranks and slickster JJ Evans will box in his home city for the first time in his 6 fight career. Popular undefeated prospects Daniel Barton from Newport and Swansea’s Kristian Touze also feature along with Jacob Robinson the son of former World Champion Steve Robinson who began his professional journey with a KO win in December. Debutants Kacper Dudzinski from Swansea and middleweight Lotty Quryshi of Cardiff complete the bumper 13 fight championship event. “This will be another fantastic night for Welsh boxing and I’m delighted we’ve secured home advantage for Ashley Brace’s second challenge for the European Title. This is Ashley’s big chance to win a major title and at the premier venue in the Welsh capital. It is great to see female boxing on the rise in the UK and Ashley can become a star for Welsh sport. It is great to have secured Gavin Gwynne another title shot and step up the ladder against an unbeaten prospect in Ciaran McVarnock from Belfast for the Celtic title. I am pleased to have reached an agreement with Queensbury Promotions for Liam Williams to feature on the show. Tickets are available on from the box office on 0117 949 6699 or ordered online at www.icearenawales.co.uk priced at £60 & £50 Ringside, £30 Unreserved Seating. Under 16’s £10 accompanied by an adult.